YRFN – upStream Aquaponics from Sustain Ontario on Vimeo. The York Region Food Network is embracing soil-less agriculture as part of building a healthy food-secure community. YRFN’s project, upStream Aquaponics in Newmarket, is a water-based soil-less agriculture system that replicates a natural system that recycles byproducts from living fish to fertilize edible plants. The facility was built over a year and started production in August 2013, growing a variety of lettuce mixes that are being sold to local restaurants in Newmarket as well as being used in YRFN programs. Watch the video to learn more about how aquaponic systems work and how YRFN sees this partnership project as a food-growing solution that can be scaled up for wholesale production or scaled down for home gardens. 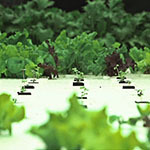 Watch more Growing Good Food Ideas videos at ontariofoodvideos.ca.